Hamsters are stout-bodied rodents with a short tail and a pair of stocky legs and skinny feet. These critters flaunt a luxuriously thick coat, which can be long or short depending on its type. Currently, there are 18 species of hamsters. The most common ones kept as pets are the winter white dwarf hamster, the Roborovski hamster, the Campbell’s dwarf hamster, and the Syrian or Teddy Bear hamster. Having hamsters as pets is like having your own reality show. Their high spirits and insatiable curiosity always charm their owners. They potter around like hyperactive children and crack you up with their swollen cheeks filled with chockfull of food. Likewise, they are easy to take care of, which makes them a good match for starters, kids, and busy persons. Unfortunately, many people are getting these critters without really understanding the requirements for keeping their pet hammy hale and hearty. True, hamsters are low-maintenance but you need to provide them with a cage that is spacious, secure, and hygienic. However, brick and mortar pet stores usually don’t sell cages that are humane enough for our small animals. If they do, they sell it at a ridiculous price. Don’t worry, though. Just scroll down the page and you will see which ones are the best hamster cages. These cages are well-reviewed and I promise you it won’t hurt your wallet. There are several points to consider when getting a cage for your hamster. Rest assured our picks below have met these requirements. According to Dr. Susan Brown, a recognized authority on exotic animals and the co-founder of the Greater Chicago Ferret Association, an adult hamster needs a minimum floor area of 20” x 20” and a cage height of 6”. You don’t necessarily have to adhere to the minimum requirement. For your pet’s best interest, I recommend that you get the biggest cage you can afford. 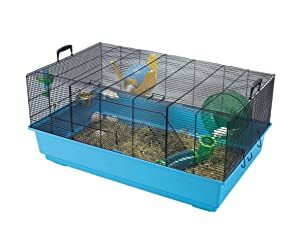 A spacious cage can benefit your pet in ways aplenty regardless if it is a dwarf hamster or a Syrian hamster. More toys for your hamster - Don’t limit your pet’s toys to old newspapers and cardboard rolls. 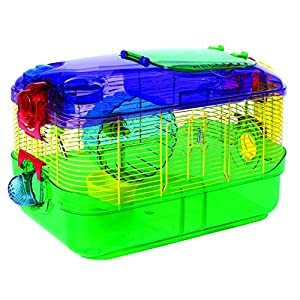 With a large cage, you can add a hamster ball, a wooden bridge, a colorful hut, and many other toys to keep your cheeky pet amused. Boosts your pet’s quality of life – Hamsters are unhappy with cramped conditions; it could lead to depression, illness, and undesirable behaviors. A generously sized hamster cage can help prevent this, provided that your pet has lots of toys to stimulate him physically and mentally. Prevents fighting – Generally, hamsters are solitary creatures. Dwarf hamsters may tolerate their siblings but they may fight if housed together in a crummy environment. This is mainly due to stress or boredom. To prevent acute or chronic stress in your pets, be sure they have ample space for running, playing, and of course, for chilling out. Your hammy will need a sufficient amount of floor space, not a vertical climbing room to heaven. Hamsters thrive best in wide spaces. This means the second story does not count when it comes to the minimum space area for your pet. Having multiple levels in a cage is good but there should be at least one large living area in addition to a separate compartment for snoozing. 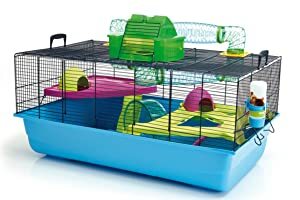 Many hamster owners prefer a modular cage to a multi-tiered cage mainly because it is a breeze to maintain. Multi-tiered cages, especially the ones with tubes and complex designs, are a real chore to clean. However, they are fun for your pets. Hamsters are among the best excavators in the animal kingdom. So, be sure the cage you choose can cater your pet’s love for digging. A good rule of thumb is to find a cage that has a deep tubby base so you can stuff it with lots of bedding. Likewise, it helps contain the shavings your hamster will kick out of the cage. Aside from hoarding food and making tunnels, hamsters are also good at squeezing their tiny bodies through minuscule gaps. Sometimes, they make their own escape route. You don’t want this to happen, especially if you have a salivating feline lurking in the shadows. Therefore, choose a rock solid hamster cage that won’t get easily knocked out. The bars should at least have ½” spacing to prevent baby Syrian hamsters or dwarf hamsters from escaping. Also, be sure the doors have locking mechanisms because hamsters are also experts at opening doors. The best option for ventilation is no other than the metal wire cage. It doesn’t have to be all metal, though. Having plastic components is fine as long as they don’t inhibit air flow and cause condensation. If you truly love your hammy, don’t settle for a cheap crummy cage and choose a habitat that your pet will enjoy. 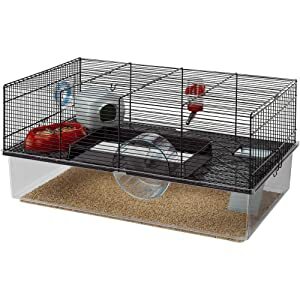 Introducing, the Prevue Pet Products 528 Universal Small Animal Home – the perfect cage for two loving hamsters. This unit measures 32 ½’’ x 19’’ x 17 ½’’. It is made with good quality materials, so you can expect your investment to last for a long time. This hamster cage is a piece of cake to assemble. The platform has 216 square inches of space, while the bottom lends 608 square inches of space. You can move the platform up or down, allowing you to put accessories either above or underneath the platform. It is also a cinch to carry this cage around since it has two top handles. However, cleaning underneath the platform would be a tad difficult but the material of the bottom cage is a breeze to clean. Believe me. Urine calcifications would be the last thing on your mind! Additionally, the cage has thoughtfully spaced bars. Your cheeky critter can scramble all over the cage as much as he wants but he could never escape through it. However, some customers voiced out their concern that a dedicated escapee could get away through the front door since it only has one safety clip. Nonetheless, you can always improvise, can’t you? The Heaven Metro Cage by Lixit Animal Care measures 31.5” x 20” x 20” and offers a good deal of vertical space. It is the perfect habitat for a chubby Syrian hamster and would be even roomier for dwarf hamsters. The blue tubby base gives enough depth to keep your cheeky critter burrow happily in a pile of bedding. It won’t take a rocket scientist to assemble this cage. The tubes fit into their connectors easily and have plenty of holes for ventilation. There is also a sturdy handle on each side to make shifting a lot easier. Without these, the moving ordeal would be way too troublesome considering its size. You may also choose to opt out the green hut and the platforms if need be. In addition, it comes with vibrant-colored accessories. Small hamsters will love the little hidey-houses but if you have a chunky one, you may use it for storing treats like seed mix. The best thing about this cage is that you can design it any way you want, as there is so much room. As one would hope for its price, the Heaven Metro Cage by Lixit Animal Care is incredibly strong and secure. The CritterVille Arcade Hamster Home is inarguably the most exciting hamster cage in this list. This unique cage by MidWest Homes is like the Arcade Hotel in Amsterdam… but for hamsters! 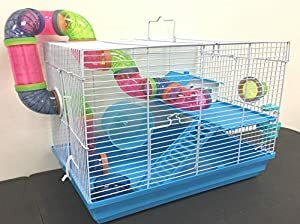 It features an amazing multi-level play area and comes with a food bowl, a water bottle, a cozy nook, an exercise wheel, and interior play tubes – all of which your hammy needs to feel perfectly at home. With a crystal clear front, you can get an eyeful of your pet while he larks about in the play area. Putting this cage together, however, is not a walk in the park. Other than that, this cage is perfect. The plastic base is sturdy and is deep enough to contain messes. 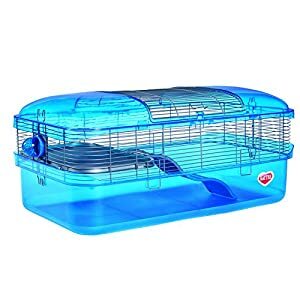 Should you choose to welcome another pet, there is a port that allows you to connect the cage with another cage and so on. This cage measures 8.11” x 11.61” x 21.26” and has 1/2 inch bar spacing. This colorful 2-level hamster cage by Mcage is also a good candidate competing for your shopping list. The food dish, water bottle, tubing, ladder, wheel, platform, and house all came with the cage. It also has a user-friendly manual so you can move your pet into his new cage in a jiffy. The cage has two access points to make feeding a lot easier. The doors open and shut fairly easy but not easy enough for your hamster to push open. The accessories are a cinch to take on and off the cage for cleaning. 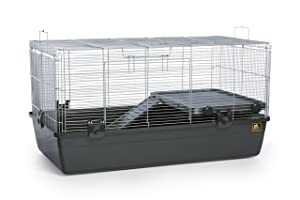 This cage measures 18.5” x 12” x 14.5" and hence, any hamster bigger than a dwarf may not have enough wriggle room. We definitely recommend this product if you have a small hammy. If you’re not a fan of tubes and alterations, you will love the simple modular design of the FAVOLA Black Hamster Cage by Ferplast. This modular home has well-defined corners. Should you ever change your mind, there is a port on the left side where a tube can be attached. The FAVOLA highlights a double-floor structure, giving your pet separate areas for his activities. The deep pan contains the bedding and provides enough depth for your cheeky critter to burrow around in a sea of bedding. Both the floors and ladder are safe for tiny feet and tails and are easy to clean, too. Additionally, this cage comes with a feeding bowl, a water bottle, a wheel, and a nesting area. You can mount the wheel either on the wire bars or in the opening of the second level. However, the size of the door is a deal breaker. You have to remove the top part of the cage if you wish to reach your pet or refill a food dish in a corner. Product dimension are 23.6” x 14.4” x 11.8”. 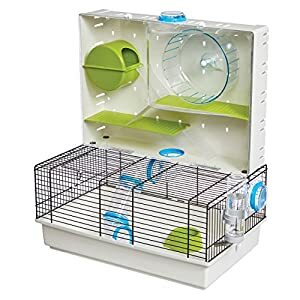 You can never go wrong with the Kaytee My First Home Multi-Level Habitat if you want to spoil your hamsters with the biggest cage your budget allows. This cage is humongous! The dimensions are 30.5" x 18" deep x 30". It can comfortably host two Syrian hamsters and still leave plenty of room for accessories. Don’t worry about your bucks jumping to their demise because the ladder slides are wide; they cover most of the open space. Moreover, this cage’s metal and plastic construction is exemplary. The wires are unbendable and the plastic components are high quality. The bottom tray is deep enough; shavings won’t get kicked out even if your bucks are roughhousing inside the cage. It also provides a darkened space for your critter just in case he wants to chill in a corner. Likewise, the shelves have raised edges to prevent seeds, bedding, or unsanitary matter from rolling off. My only gripe is that you have to remove all its parts when cleaning. There is more to the GalaPet Blue Hamster Habitat than its eye-candy looks. This cute blue cage boasts of an uncompromising construction of plastic and metal wire. This cage also has sturdy handles so it is easy for you to shift the unit from one room to another. Additionally, it comes with oodles of accessories to keep your cheeky critter amused. The best freebie is definitely the wheel, which is the perfect size for a hamster and is among the quietest ones you can ever find. With so many toys, your hammy will surely remain fit and happy. The downside, however, is the quality of the clips; they are rather flimsy compared to other plastic components. You may have to use zip ties to make the cage more securely locked. That aside, it is a beautiful functional cage. I believe its quality, price, and the number of good items that came with it is enough to cover its flaw. The dimensions of the cage are 17.3” x 12.6” x 13.8”. Another product competing for a spot in your shopping list is the Mickey 2 Hamster Cage. The XL version of this Belgium product measures 31.5” x 20” x 15” and so, it is ideal for a Syrian hamster. You can fit plenty of toys to amuse your cheeky critter and still have plenty of room for him to move around. The base is 6.5” deep and the wire spacing is ¼”. Therefore, you can sleep at night knowing your hamster is never getting out. You won’t also wake up only to find scattered beddings on the floor. Its assembly requires a little muscle but it will get easier once you get the hang of it. 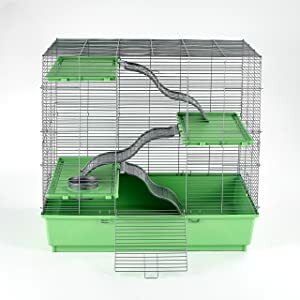 Additionally, this cage comes with a metal wire platform, a hidey-house, a drinking bottle, an exercise wheel, and a feeding bowl. The tube remains within the cage, so you won’t have to worry about him escaping through the exterior holes. Also, you can do without the metal shelf or cover it with felt; otherwise, your pet’s feet might get stuck. Another good thing about this cage is its sturdy handles. The latches to close the opening and hook the wire to the blue plastic bottom are secure as well. 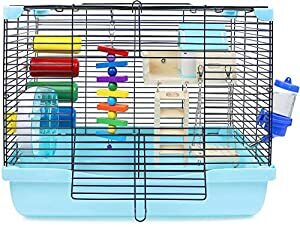 This striking 2-level blue cage by Kaytee, also known as the Super Habitat, offers plenty of room for your hamsters to live comfortably. This cage comes with a ramp, a shelf, and a bubble plug for LED lights. There is also a port door connector for CritterTrail accessories, which you should buy separately. The base of the cage is semi-translucent to ensure you won’t miss out on anything. The rounded corners allow for easy cleaning , while the large access door on the top allows safe removal of pets. The Kaytee CritterTrail 1-Level Multicolor Habitat is too cute to brush aside. Assembling this beautiful cage is child’s play. Apart from its lively rainbow colors, it comes with a decent wheel, a removable petting zone, and a no-spill bottom. My only gripe is that you need to take the pieces apart for cleaning and unfortunately, the translucent plastic components are fragile and can shatter easily. Don’t get me wrong but it is a fine cage for the price. It even has a water bowl, an exercise wheel, and a food dish. However, I do not recommend it as a stand-alone cage but rather an extension of a larger setup. You may also use it for temporary storing, such as while cleaning or moving.